Johannes Bjerva, Isabelle Augenstein. From Phonology to Syntax: Unsupervised Linguistic Typology at Different Levels with Language Embeddings. Proceedings of the 16th Annual Conference of the North American Chapter of the Association for Computational Linguistics: Human Language Technologies (NAACL HLT 2018). Ben Eisner, Tim Rocktäschel, Isabelle Augenstein, Matko Bosnjak, Sebastian Riedel. emoji2vec: Learning Emoji Representations from their Description. Proceedings of the International Workshop on Natural Language Processing for Social Media (SocialNLP at EMNLP 2016), November 2016. Best Paper, also featured in Denny Britz's AI Newsletter. [Poster]. Johannes Bjerva, Yova Kementchedjhieva, Ryan Cotterell, Isabelle Augenstein. A Probabilistic Generative Model of Linguistic Typology. Proceedings of the 17th Annual Conference of the North American Chapter of the Association for Computational Linguistics (NAACL 2019), June 2019. Alexander Hoyle, Lawrence Wolf-Sonkin, Ryan Cotterell, Hanna Wallach, Isabelle Augenstein. Combining Sentiment Lexica with a Multi-View Variational Autoencoder. Proceedings of the 17th Annual Conference of the North American Chapter of the Association for Computational Linguistics (NAACL 2019), June 2019. Mareike Hartmann, Tallulah Jansen, Isabelle Augenstein, Anders Søgaard. Issue Framing in Online Discussion Fora. Proceedings of the 17th Annual Conference of the North American Chapter of the Association for Computational Linguistics (NAACL 2019), June 2019. Johannes Bjerva, Robert Östling, Maria Han Veiga, Jörg Tiedemann, Isabelle Augenstein. What do Language Representations Really Represent?. Computational Linguistics, Vol. 45, No. 2, June 2019, to appear. Sebastian Ruder, Joachim Bingel, Isabelle Augenstein, Anders Søgaard. Latent multi-task architecture learning. Proceedings of the 33rd AAAI Conference on Artificial Intelligence (AAAI 2019), January 2019. Yova Kementchedjhieva, Johannes Bjerva, Isabelle Augenstein. 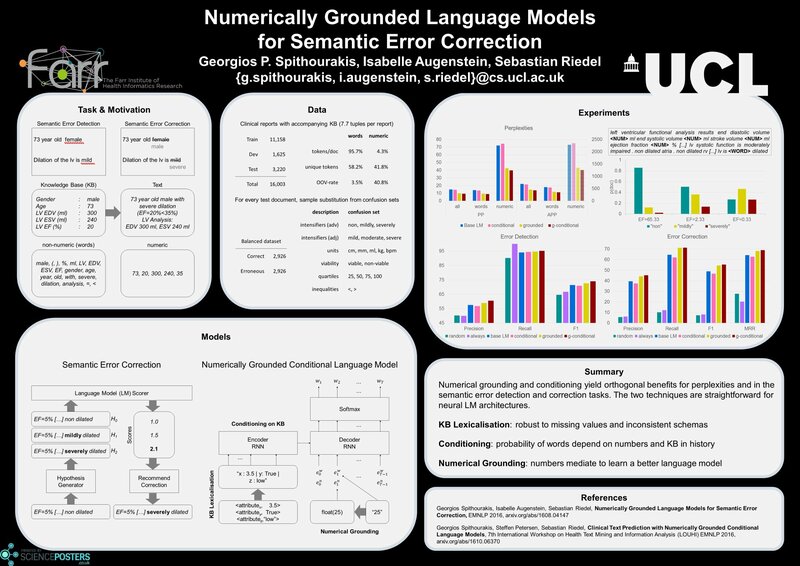 Copenhagen at CoNLL--SIGMORPHON 2018: Multilingual Inflection in Context with Explicit Morphosyntactic Decoding. Proceedings of ConLL--SIGMORPHON 2018. Ana Valeria Gonzalez-Garduño, Isabelle Augenstein, Anders Søgaard. A strong baseline for question relevancy ranking. Proceedings of the Conference on Empirical Methods in Natural Language Processing (EMNLP 2018). Miryam de Lhoneux, Johannes Bjerva, Isabelle Augenstein, Anders Søgaard. Parameter sharing between dependency parsers for related languages. Proceedings of the Conference on Empirical Methods in Natural Language Processing (EMNLP 2018). Anders Søgaard, Miryam de Lhoneux, Isabelle Augenstein. Nightmare at test time: How punctuation prevents parsers from generalizing. Proceedings of the Analyzing and interpreting neural networks for NLP (BlackboxNLP at EMNLP 2018). Isabelle Augenstein, Kris Cao, He He, Felix Hill, Spandana Gella, Jamie Kiros, Hongyuan Mei, Dipendra Misra. Proceedings of The Third Workshop on Representation Learning for NLP. (Repl4NLP at ACL 2018). Katharina Kann, Johannes Bjerva, Isabelle Augenstein, Barbara Plank and Anders Søgaard. Character-level Supervision for Low-resource POS Tagging. Proceedings of the 1st Workshop on Deep Learning Approaches for Low Resource Natural Language Processing (DeepLo at ACL 2018). Thomas Nyegaard-Signori, Casper Veistrup Helms, Johannes Bjerva, Isabelle Augenstein. KU-MTL at SemEval-2018 Task 1: Multi-task Identification of Affect in Tweets. Proceedings of the International Workshop on Semantic Evaluation (SemEval at NAACL HLT 2018). Arkaitz Zubiaga, Elena Kochkina, Maria Liakata, Rob Procter, Michal Lukasik, Kalina Bontcheva, Trevor Cohn, Isabelle Augenstein. Discourse-Aware Rumour Stance Classification in Social Media Using Sequential Classifiers. Information Processing & Management, Volume 54, Issue 2, March 2018, Pages 273-290. Benjamin Riedel, Isabelle Augenstein, Georgios Spithourakis, Sebastian Riedel. A simple but tough-to-beat baseline for the Fake News Challenge stance detection task. CoRR, abs/1707.03264, July 2017. Elena Kochkina, Maria Liakata and Isabelle Augenstein. Sequential Approach to Rumour Stance Classification. Proceedings of the ACL Workshop on Women and Underrepresented Minorities in Natural Language Processing (WiNLP at ACL 2017), July 2017. Elena Kochkina, Maria Liakata and Isabelle Augenstein. Turing at SemEval-2017 Task 8: Sequential Approach to Rumour Stance Classification with Branch-LSTM. Proceedings of the International Workshop on Semantic Evaluation (SemEval at ACL 2017), July 2017. Isabelle Augenstein, Leon Derczynski, Kalina Bontcheva (2017). Generalisation in Named Entity Recognition: A Quantitative Analysis. Computer Speech & Language, Volume 44, July 2017. Ziqi Zhang, Anna Lisa Gentile, Isabelle Augenstein, Eva Blomqvist, Fabio Ciravegna (2017). An Unsupervised Data-driven Method to Discover Equivalent Relations in Large Linked Datasets. Semantic Web, Volume 8, Number 2 / 2017. Isabelle Augenstein. Web Information Extraction using Distant Supervision. PhD theses: Department of Computer Science, University of Sheffield, UK, July 2016. Piroska Lendvai, Isabelle Augenstein, Dominic Rout, Kalina Bontcheva, Thierry Declerck. Algorithms for Detecting Disputed Information: Final Version. FP7-ICT Collaborative Project ICT-2013-611233 PHEME Deliverable D4.2.2 (WP4), June 2016. Piroska Lendvai, Isabelle Augenstein, Kalina Bontcheva and Thierry Declerck. Monolingual Social Media Datasets for Detecting Contradiction and Entailment. Proceedings of International Conference on Language Resources and Evaluation (LREC 2016), May 2016. Diana Maynard, Kalina Bontcheva, Isabelle Augenstein. Natural Language Processing for the Semantic Web. Morgan & Claypool Semantic Web Synthesis Series, December 2016. Isabelle Augenstein, Diana Maynard, Fabio Ciravegna (2016). Distantly Supervised Web Relation Extraction for Knowledge Base Population. Semantic Web Journal, Volume 7, Number 4 / 2016. Leon Derczynski, Isabelle Augenstein, Kalina Bontcheva (2015). USFD: Twitter NER with Drift Compensation and Linked Data. Proceedings of the ACL Workshop on Noisy User-generated Text (W-NUT at ACL 2015), July 2015. Isabelle Augenstein (2014). Joint Information Extraction from the Web using Linked Data. Doctoral Consortium Proceedings of the 12th International Semantic Web Conference (ISWC 2014), October 2014. Ziqi Zhang, Anna Lisa Gentile, Isabelle Augenstein (2014). Linked Data as Background Knowledge for Information Extraction on the Web. ACM SIGWEB Newsletter, July 2014. Ziqi Zhang, Anna Lisa Gentile, Eva Blomqvist, Isabelle Augenstein, Fabio Ciravegna (2013). Statistical Knowledge Patterns: Identifying Synonymous Relations in Large Linked Datasets. Proceedings of the 12th International Semantic Web Conference (ISWC 2013), October 2013. Eva Blomqvist, Ziqi Zhang, Anna Lisa Gentile, Isabelle Augenstein, Fabio Ciravegna (2013). Statistical Knowledge Patterns for Characterizing Linked Data. Proceedings of the 4th Workshop on Ontology and Semantic Web Patterns (WOP at ISWC 2013), October 2013. Ziqi Zhang, Anna Lisa Gentile, Isabelle Augenstein, Eva Blomqvist, Fabio Ciravegna (2013). Mining Equivalent Relations from Linked Data. Proceedings of the 51st Annual Meeting of the Association for Computational Linguistics (ACL 2013), August 2013. Anna Lisa Gentile, Ziqi Zhang, Isabelle Augenstein, Fabio Ciravegna (2013). Unsupervised Wrapper Induction using Linked Data. In Proceedings of the 8th International Conference on Knowledge Capture (K-CAP 2013), June 2013. Isabelle Augenstein (2011). LODifier - Generating RDF from Natural Language. Heidelberg University, Department of Computational Linguistics, July 2011.